Kat is the youngest of three sisters. Her oldest sister is to marry a very wealthy—albeit older—Sir Neville. Kat thinks this is absolutely no good, and when her middle sister Angeline tells her about Sir Neville's last wife, she knows that this engagement can not be allowed to happen. On top of all this, Kat is slowly finding out more about her mother, who was a witch. Kat also finds out that she herself might have some magic in her too. When she finds a golden compact mirror that transports her to a golden hall when she opens it, Kat is met by two strangers. Mr. Gregson and Mrs. Fotherington are not the most genial of company especially the latter of the pair. Gregson wishes to tutor Kat to help her develop her magical talent, but Kat has too much to worry about in real life to deal with him right now. Kat knows that Sir Neville is not a proper suitor for her sister, she just needs to find a way to stop him. I was so excited to receive this books for review. I have been wanting to read it for more than a year. I was a little disappointed though. The biggest disappointment for me was the climax; there was a lot of build up but then everything was just explained instead of slowly revealed. I didn't like it one bit, I felt like it was done in a rush so that the author could hurry up and finish the book in under 300 pages. Besides that huge deal though, this book was very wonderful. Kat was an incredibly playful and fun character that I wish could be my little sister. I loved how her older sisters treated her like a younger sister, it seemed very realistic to me. The older sisters had this elite sort of relationship, due in large part to the fact that they both knew their biological mother whereas Kat did not. The stepmother was absolutely dreadful, but not too wicked. She wanted to be very proper, but was on the verge of being a spinster and therefore had to marry the girls' father. Not her first choice, but a choice nonetheless. I think this will be a completely delightful read for younger kids and the splash of magic makes the book very wonderful. 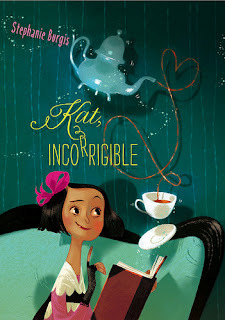 It was still a delight to read and I look forward to see what Kat gets herself into in the next novel. "I was twelve years of age when I chopped off my hair, dressed as a boy, and set off to save me family from impending ruin." "Perhaps she would even explode."